When Singapore's Loh Kean Yew defeated Chinese legend Lin Dan in straight games 21-19, 21-18 to win the Thailand Masters in Bangkok in January it set the badminton world abuzz. The Penang-born Kean Yew is the brightest spark in Singapore badminton as the island republic hopes to make inroads in the shuttle sport, at least in the region for a start. 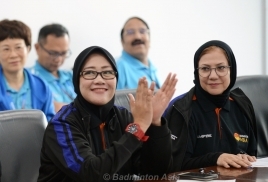 However, in coach Mulyo Handoyo's own words Singapore shuttlers "need to be consistent in their game to move up the ladder" and establish some reputation as a threat on the court. A week after his success, Kean Yew, currently ranked No 58, finished runners-up in the RSL Swedish Open. Kean Yew, who "will do anything my parents ask me to do" is determined to take his badminton career greater heights and strongly believes that he "will be there" among the big names. "There are certain flaws in my game to be ironed out. I need to be cool in my game and handle pressure well. This has been my weakness but the plus point is that I have managed to cut that down to a certain extent," said Kean Yew who wants to win a medal in the Olympics for his new country Singapore. Kean Yew and his elder brother Kean Hean are now Singapore citizens. Kean Hean is also in Singapore national team as a doubles player with Toh Han Zhuo. 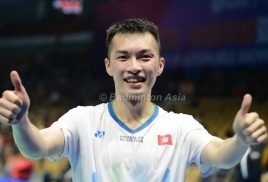 Handoyo, who moved to Singapore at the end of last year after terminating his contract with India, however, sees hope in Singapore badminton. Singapore turned out to be the surprise package in this year's Badminton Asia Tong Yun Kai Cup which ended at the Queen Elizabeth Stadium in Wanchai, Hong Kong China on Sunday. The island republic reached the knockout stage of the championships before bowing out to Indonesia 3-0 in the quarter-finals. Singapore lost narrowly to fourth seeds Chinese Taipei 3-2 in their opening Group B match but staged a remarkable upset with a 3-2 win sixth seeds India in the second match. India's 3-2 defeat at the hands of Chinese Taipei saw Singapore qualify for the knockout stage. "We (Singapore) have the best sports facilities and badminton benefits a great deal in this respect," added Handoyo.